I read this book simply because it’s in School Library Journal’s Battle of the Books, which commences March 10. I’m not sure what I expected, since I hadn’t heard much about it, but I was blown away and kept reading well into the night. This is a rare book that’s written in second person voice, addressed to “you.” But the speaker is not addressing the reader. It soon becomes clear that she’s addressing the young man she loves. We came here by ship, you and I.
I was a baby on my mother’s knee, and you were a lisping, curly-headed boy playing at your mother’s feet all through that weary voyage. Watching us, our mothers got on so well together that our fathers chose adjacent farm plots a mile from town, on the western fringe of a Roswell Station that was much smaller then. I remember my mother telling tales of the trip when I was young. Now she never speaks of it at all. She said I spent the whole trip wide-eyed, watching you. She still watches him. She remembers when he smiled at her, gave her posies. But something terrible happened, and now the whole village barely notices she is there. We get bits of what happened, all along the way. We find out why she doesn’t speak. She was gone for two years. When she came back, she was out of her head, left for dead, with half her tongue cut out. Then ships are sighted off the shore, coming toward the town. The Homelanders are bringing war to them, wanting their fertile farms. All the men of the town must fight, even though their arsenal was destroyed, even though they are doomed. But Judith knows where to find help – only she must confront her own nightmares. And after she does so, everything changes. This book is marvelously constructed, revealing bits of the past at a natural pace, as it comes up in the present, finally with mysteries solved at the very end. I find myself wanting to read it all over again, knowing now how it all fits together. And ultimately, it’s a love story. And a story of healing. And a story of courage. And a story of a wounded girl finding her voice. I’m featuring authors whose books were 2013 Sonderbooks Stand-outs, and it was not their first appearance as a Stand-out. Now I’m looking at authors who have Sonderbooks Stand-outs for the fourth time in 2013. One of those, Diana Peterfreund, has had every book of hers I read be listed as a Sonderbooks Stand-out, and what’s more, twice her books have been #1 in Teen Fiction. Her first book, Rampant, was #1 in Teen Fiction in 2009 Sonderbooks Stand-outs, and this year she did it again with Across a Star-Swept Sea. Last year, For Darkness Shows the Stars was #2 in Teen Fiction in 2012 Sonderbooks Stand-outs, and her #5 showing in 2010 Sonderbooks Stand-outs with Ascendant was a very low showing by Diana Peterfreund’s standards. I hope she will have many more books forthcoming. I have a feeling she doesn’t know how to write a book I don’t love. I’ve been a fan of Karen Casey’s writings for several years now. After I went through her daily meditations book, Each Day a New Beginning for a full year and a half, I wanted to start another one. Peace: A Day at a Time is a collection of meditations from Karen Casey’s other books, so some were, indeed, a repeat from Each Day a New Beginning. But that’s all good! Her writings indeed help you start each day at peace. The more comfortable we are with the knowledge that each of us has a unique journey to make, a specific purpose to fulfill, the easier it is to let other people live their own lives. When family members are in trouble with alcohol or other drugs, it’s terribly difficult to let them have their own journey. Because we love them, we feel compelled to help them get clean and sober. In reality, all we can do is pray for their safety and well-being. Their recovery is up to them and their Higher Power. For some of us it’s a leap of faith to believe there really is a Divine plan of which we are all a part. And perhaps it’s not even necessary to believe. But we’ll find the hours of every day gentler if we accept that a Higher Power is watching over all of us. Being able to let others live and learn their own lessons is one of our lessons. The more we master it, the more peaceful we’ll be. This book is highly recommended for daily thoughts on letting go and living the life you were made to live. Candlewick Press, 2013. 60 pages. I should mention right up front that I’ve met Monica Edinger on a few occasions and had a chance to talk with her and enjoyed the conversation tremendously. She is one of School Library Journal’s Battle Commanders in the Battle of the Books! So I was definitely predisposed to like this book. But there’s a whole lot to like! This book is based on a true story of Margru, a girl who was on the ship Amistad, where the slaves fought back. She ended up gaining her freedom and going back to Africa in her adulthood as a missionary. And the story is a dramatic one. It covers Margru being sold into slavery, the dramatic revolt on the ship (after they had already landed in Cuba and been sold), and then the long process where the mutineers were put on trial and their fate was decided. During this process, it also describes Margru’s feelings about America (All those clothes! And snow!) and how she went to school, became a Christian, and decided to train to be a teacher to teach her people at home in Africa. The book is not long, and there are illustrations on every set of pages, so it’s accessible to children who are as young as Margru, nine years old when she was sold into slavery. A powerful story that really happened, this will capture children’s imaginations. I’m doing a series on Stand-out Authors, looking at authors with books among my 2013 Sonderbooks Stand-outs who have had books on previous years’ lists. Steven Stosny is tied for second place with five books that are Sonderbooks Stand-outs. His contribution this year, Living and Loving After Betrayal: How to Heal from Emotional Abuse, Deceit, Infidelity, and Chronic Resentment was #1 in Nonfiction. The first book I read by Steven Stosny was also #1 in Nonfiction (Personal Growth) on the 2006 Sonderbooks Stand-outs. 2006 was the year my life completely fell apart, and his book You Don’t Have to Take It Anymore was one of the most helpful books I read the whole year. I got to go to Steven Stosny’s Relationship Boot Camp, and this manual holds much of the information. All of his books are so affirming, and this one emphasizes that aspect of healing. You can see why I think of Steven Stosny’s books as a huge part of my healing process! They are all highly recommended. It’s time for Sonderling Sunday! That time of the week when I play with language by looking at the German translation of children’s books, or, in this case, of an English classic, Pride and Prejudice. 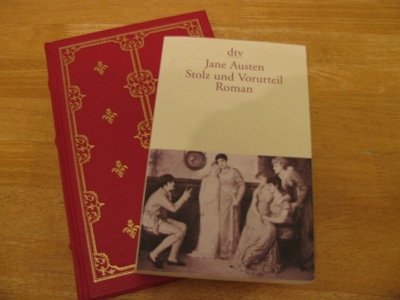 Last time I looked at Stolz und Vorurteil, we covered Chapter Two, so this time we are on Kapitel Drei. This begins on page 8 in my English edition, Seite 12 auf Deutsch. And that’s the end of Chapter 3. There were lots of fun, descriptive words in this section. The next time you see einen stattlichen Mann, who is erstaunlich gutaussehend and außerordentlich sympathisch, for whom you have much Bewunderung, you’ll know how to give a befriedigende Beschreibung! Feiwel and Friends, New York, 2014. 552 pages. Cress continues the Lunar Chronicles, begun in Cinder, and continued in Scarlet. All of the books play off a fairy tale, in a science fiction setting, but the story they tell is something wholly new. All of the books do feature a romance for our heroine, and each of those romances is totally different from the others. I completely loved Cinder, but wasn’t as enthusiastic about Scarlet. I didn’t really buy the creation of wolf-human hybrids, or if they exist that Scarlet would fall in love with one. Cress gets back to the rest of the story, so I again loved this volume. In case you don’t get the reference, Cress is a version of “Rapunzel,” since that’s essentially what the German word means. Never mind that in this case, “Cress” is short for “Crescent Moon.” Instead of a tower, Cress is imprisoned in a satellite. She’s good at hacking, so she tracks all the Earthen news feeds for the Lunar Queen, and enables them to hide the Lunar ships. Cress has been ordered to track down Cinder and Thorne, who now have Scarlet and Wolf along with them. But instead of giving them up to the Lunars, she contacts them and convinces them to rescue her. But then the witch — actually, the mind-controlling thaumaturge — returns unexpectedly, and the rescue doesn’t go as planned, separating the team into different groups. Cress and Thorne are thrown together, trying to survive in the desert. Meanwhile, Cinder needs to make plans. Above all, she needs to stop the wedding of Queen Levana to Emperor Kai. Marissa Meyer is skilled at keeping us interested in several different plot threads at the same time. She keeps the sections short, but they’re equally packed with action, so we’re never annoyed with her for what she left behind. Cress is quite different from our earlier two heroines. She’s naïve and given to daydreams, which makes sense for a girl imprisoned in a satellite. Yes, she has long hair. The thaumaturge didn’t allow sharp objects on the satellite. She’s short, and she’s a shell with no mind-control powers, so you might think she wouldn’t help their mission. But her detailed knowledge of Lunar cyberwarfare is exactly what they need. This book works as a book in a quartet should — it’s got a wonderfully satisfying story on its own, with a beginning, middle, and end. But there’s definitely a bigger story still going on, and Queen Levana still threatens Earth at the end of this book. The next book, Winter, is promised “soon,” and I can hardly wait! Atheneum Books for Young Readers, 2013. 327 pages. For as long as raccoons had inhabited the Sugar Man Swamp, which was eons, they had been the Official Scouts, ordained by the Sugar Man himself back in the year Aught One, also known as the Beginning of Time. Of course, Bingo and J’miah would follow the orders. They knew them by heart. The first additional order was easy enough, as we shall soon see, but the second was a different matter. The problem? Nobody really knew exactly where the Sugar Man slept, only that it was somewhere in the deepest, darkest part of the swamp. He hadn’t been seen in many years. An emergency does come up in the course of the book. And waking up the Sugar Man is indeed a problem. We also follow the fortunes of Chap Brayburn and his mother, who run Paradise Pies, by the edge of the swamp. Chap’s Grandpa Audie recently died. Grandpa Audie had loved the swamp, just as Chap does. But now the owner of the swamp, Sonny Boy Beaucoup, is planning to evict them, unless they can come up with a boatload of cash. Then he’s going to pave over the swamp and build The Gator World Wrestling Arena and Theme Park. So both Chap and the raccoons are facing emergencies. Emergencies that the Sugar Man can solve. But how to find him? And how to wake him up without incurring his wrath? It’s going to take some careful work. This story is told with a folksy voice, which I found slightly annoying, but could be charming. Our library doesn’t have the audiobook on CD, but in Capitol Choices I’ve heard that this version is completely delightful. There are tall tale elements in the tale and over-the-top characters. The result is a lot of fun and would make great family listening. Chronicle Books, San Francisco, 2013. 32 pages. This book is terribly silly, but it makes me laugh. Throughout the story, there are words and phrases that are anagrams of one another, set off with the same typeface as the other part of the pair. and bring me your AUNT. Robert doesn’t even have an aunt! GRANDMA REAGAN is in ANAGRAM DANGER! You can tell the story isn’t exactly profound. 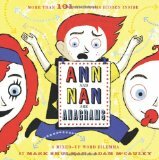 But, combined with the exuberant pictures and more than 101 anagrams hidden in the book, it’s still a lot of fun. I like some of the products sitting on the kitchen shelves: Old Nose Noodles, A Mean Noisy Mayonnaise, Mad Scrubber Bread Crumbs, and Eats? Ouch Hot Sauce. Some of the anagrams are really a stretch, such as Nature’s Rat Restaurant. But it’s all in good fun, and kids will have fun spotting them all. If you like word play, it’s hard to resist this silly book. You are currently browsing the Sonderbooks blog archives for February, 2014.